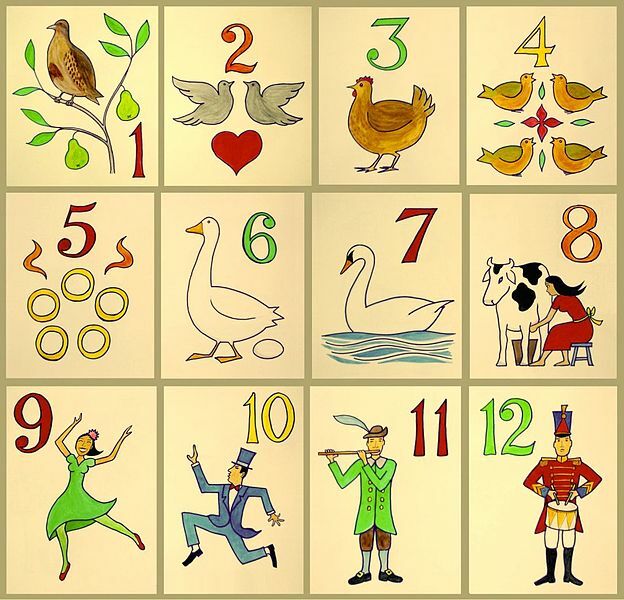 Yesterday was the 12th day of Christmas, if you’re keeping up with the rather archaic tradition. But I didn’t give or receive 12 drummers drumming. No…my true love braved the wind and tucked away the last of the outdoor decorations in their storage tubs while I dismantled the Christmas tree. Today the decorations and tree will head back to their space in the attic, and that will conclude the holiday season. I am very grateful to be indoors because baby it is definitely COLD outside. We are expecting to hit 8 degrees (F) today. I’m not sure we’ve dipped down to single digits in a couple of years, and I really don’t remember the last time we had such a chilly day. With the first week in 2014 past, here’s where I’m at on my resolutions, which address four areas: spiritual, cooking, health and cleaning/organizing. I’m also planning to try Reddit’s 52 Weeks of Cooking challenge. The first week was eggs, and I took a stab at shirred (baked) eggs on Saturday. Let’s just say I need to give them another go…and not overcook them. The concept has great potential for weekend Eggs Benedict if I can perfect the cooking time. This week’s challenge is to try a Polish dish. I like stuffed cabbages, but my family is not fond of them, so I’m not sure what we’ll do…maybe pierogies? To counteract the effects of taking a cooking challenge, my healthy side will continue incorporating more juicing into my weekday meals, and I’m gong to reintroduce myself to my Body Pump classmates and the treadmill. I lost a solid five pounds in the weeks leading up to the holidays and – more importantly – lost my sweet tooth. Not a single piece of Halloween candy. Alas, the sweet tooth found its way home for the holidays, but if I lost it once, I can do it again. On the cleaning/organizing side of things, I am…intrigued by this weekly challenge. It looks interesting, but we’ll see if I can stick with it long-term. So how are you settling into 2014? Do tell! I’ve been mentally contemplating a “laundry list” of new foods I want to try to make in the new year. Why wait when you can jump right in on New Year’s Day? Despite grafting myself in (via marriage) to the south, I have been slow to warm up to black-eyed peas. For the longest time, Pam’s black-eyed pea salad was the only recipe I liked well enough to incorporate these humble legumes into a meal. But times and tastebuds change, and this year, Hoppin’ John (bottom right in the picture below) was on the New Year’s Day menu, along with dirty rice (small blue ramekin) and shrimp gumbo (in the Dutch oven and dark blue bowl on the left). Side note – I do love my Fiesta shallow bowls/deep plates…they come in so handy, whatever you call them. Like most southerners, I’ve eaten my share of dirty rice and gumbo (and made a few attempts to make my own) over the years. I’ve never been particularly thrilled with my own efforts, so I scrapped those old recipes and tried half-size versions of two new ones. 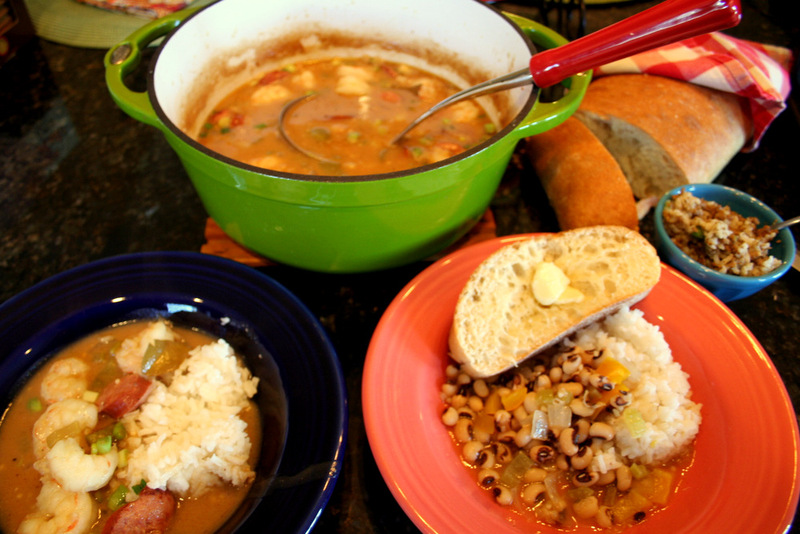 Coastal Living’s Gumbo was easy and delicious; Prairie Woman’s Hoppin’ John was also a winner. Paula Deen’s dirty rice was a tad heavy on the chicken livers (which was my fault – the tub I bought didn’t indicate volume, so I guessed it was a pound, and I think it was larger than that), and even when I cut it in half, it made a HUGE batch. So for smaller families, I’d suggest cutting it to 25% and easing up on the chicken livers – maybe just a couple in there. And I’m also going to try Reddit’s 52-weeks of cooking challenge. What new food adventures are you ready to embark upon this year? Life really is too short to eat the same ‘ol, same ‘ol all the time (even though we have our favorite recipes just like everyone else.) And the worst thing that can happen with a new recipe is that it bombs – if it does, your next meal is only a few hours away. So I dare you to plunge in – look through a cookbook or recipe site – and find something new to cook …soon! Yep, it’s that time again. New year, new opportunity to renew commitments to myself. Looking back over the past few years, I realize that my resolutions have focused mainly on self: lose weight, get more organized, spend more time in Bible study. All are good, wholesome (and hard-to-keep) commitments, but ultimately, every resolve revolves around little ol’ me. And the longer I live, the longer I realize it’s not about me. This year, I do plan to run, stretch and exercise. A lot. And study scripture and pour out my heart to God. Every day. And organize a lot more stuff. Starting with my closet. be a friendly face to more people I meet. And to be a better friend to those I already count among casual acquaintances and close confidantes. show my faith in action to others. To live with more integrity. And show more of the grace and mercy I receive when I fail. honor my family with more thoughtful menu choices. honor God in more ways. And let Him show me those ways. look for opportunities to make our home the most pleasant place for family and friends to gather. More frequently. spend more time enjoying the company of those I love. Because time is the one thing we can’t make for ourselves or save up for a rainy day. and to look harder for the good, in those I meet and in whatever situation I find myself in. Because whether you look for the good or the bad, you will find it. I heard this quote recently during a sermon, and it seems a fitting way to sum up my resolutions. So what are you resolved to do this year? Do share…it increases your odds of following through on them, you know! By the time June rolls around, spring has given way to summer’s heat and January is just a distant memory. Cold weather? I can barely remember what it is to wear shoes and sweaters. By now, resolutions often ring a faint bell but they are pretty hazy this far away. 1. Read my Bible daily. First half of the month, right on track. Second half, not so much. I won’t whine or make excuses, it is what it is. But there is now this frequent niggle and nudge inside me to pick it up and read it more days than not. I’m encouraging that niggly nudge to grow and get stronger. It’s the same feeling that can get me up and going to the gym before daybreak. 2. Exercise. At the risk of repeating myself, see #1 above. First half of the month, definitely on track. Second half, other things took priority. And I don’t kid myself that gardening burns as many calories as the gym. I may sweat buckets while dragging the hose and digging weeds, but the exertion level is not the same. However, I’m okay with my results for the past four weeks; the things that overshadowed my regular routine were important and urgent and are now completed, so no more excuses. And my weight dropped beneath 120 earlier this month. It still hovers and flutters around that mark, but we’re headed in the right direction. Anyone trying to lose a few pounds, take heart. Changing the way you eat and exercise are key – they don’t always yield dramatic results, but be patient and let them work their slow magic. 3. Prayer life. It’s not without ceasing but it is regular and more frequent than daily. I pray for health of friends and family and for many who are near-and-dear to my nearest-and-dearest. I try to stop and appreciate and give thanks for the abundance of good things that happen every day. From small mercies to big blessings, all good things come from God and I hope I never forget that or fail to give Him thanks. 4. Cultivating the fruits of the spirit. This one is still an enigma. I know I set it as a resolution but how can I measure this? It isn’t like cultivating plants in my garden. I can see how my plants grow; I can see them mature and bloom and bear fruit. I know there must be a way to similarly see and measure this growth but in the meantime, I keep praying and studying know the more I do that, the more the fruit will grow. 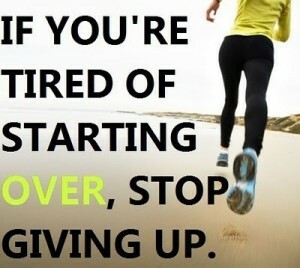 I hope this month finds everyone thinking back on whatever you resolved to stop or start roughly 150 days ago. Whether you’re struggling to keep those promises, or struggling to even remember what you promised yourself, there’s no time like today to get started. And think how great it will feel in December to know you made good on your resolutions in 2012 and see the results of your efforts. In my case, the “special broadcast” was spring. Last month was a blur. I could make excuses longer than my list of resolutions but I’ll sum it up like this. Life, as in plants and Bible curriculum writing, were at the top of my to-do list in my spare time, along with keeping up with my mother-in-law’s health issues. They all cut in line ahead of my resolutions. Reading my Bible? I haven’t read ANYthing outside of Bible class and worship. No magazines, no books, not even the back of a cereal carton And unfortunately, no serious individual Bible study time. Exercise? The month was a roller-coaster of hit-or-miss at best. One week, I logged a whopping 20 miles on the elliptical AND I’ve been up and down on my knees countless times to dig in countless plants. My bum knee hasn’t forgiven me and probably won’t for a while. At least yoga is still my friend. I’m not stepping on the scale for a few more weeks – I don’t need it to tell me what I already know. Prayer life and cultivating the fruits of the spirit? Well, if there’s anything positive that comes from being down on your knees pulling weeds and planting, it’s that you have a lot of time to meditate and pray so I took advantage of the situation to do both. I did manage to keep my desk clean, but only because I have temporarily relocated to Mr. Official’s man-cave to work for a few weeks since I need repeated access to the printer and my aforementioned knee has made it clear it doesn’t want to traipse up and down the stairs every time I print off something. So when we’re up, we’re up – and when we’re down, we’re down. How are your resolutions coming? Are they still going strong, or fading slowly from view? The best news is we don’t have to wait for next January 1 to resolve to change something in our lives. There’s nothing magical about making a resolution on that date; as you can see from my monthly checkups, there’s nothing that will make a resolution take root except your own willingness to keep pushing yourself to make it happen. Month three: So how ’bout them resolutions? And here we are, 90 days into 2012. Are you still hanging tight with your resolutions or are you struggling to recall what they were? (We’ve all experienced that before.) This year, I’m sticking to my guns better than most years, but as you’ll see there have been some bumps along the way this month. 1. Cultivate a daily prayer life. My goal last month was to make prayer and Bible reading a priority first thing in the morning. I’m 1 for 2: prayer yes, Bible reading, no. 2. Read the Bible through in 2012. There’s no way to gloss over the fact I’ve completely fallen behind on this. Truth be told, I haven’t read ANYTHING in the last month – no magazines, no books, no nothing, except online stuff that is directly related to work and blogging. And every day I fall further behind, I cringe because it means I’m two readings behind. So instead of trying some marathon make-up reading, I’m dropping back to one reading a day, and trying Seinfeld’s “don’t-break-the-chain” starting today. Here’s hoping it works. Stay tuned, update in 30 days. 3. Exercise at least 4 days a week and drop the last 15 pounds I want to lose. This week, three days of running (12 miles total), plus yoga and pilates. My goal weight is 110. I’m back to 121, which doesn’t sound like much of a stride, until I explain my weight bounced up to 125 early this month, a delayed reaction to last month’s overindulgence in sweets; it prompted an introspective look into my psyche a few days ago. The running helps; I just need to figure out how to still squeeze in an hour or two of weights a week while maintaining the early morning runs. 4. Get my desk organized and keep it that way. A qualified success. I’m still wrestling with the way I deal with incoming mail, but I have a basket to hold it now until I cull out the bills and toss the junk, pretty much once every week to ten days. My blotter has stayed visible all month. Woot! 5. Cultivate the fruit of the spirit in my life. If you need to start over in April, that’s okay – just commit to making it the last time to start over. So, how’s everyone doing? It seems this is where daily routines start to become habits, but some things are just plain hard to put into regular practice and to be honest, I’ve stumbled in a few areas. My goal is to pour a cup of coffee, do my daily Bible reading and then spend time in prayer. It’s putting “first things first.” Is it a habit yet? Nope. In fact, right now I’m a few days behind on my reading. Again. But I’m trying! Still (pretty much) on track. This month, I worked my way through Job, Ezra, Nehemiah, Esther and most of Isaiah, plus Paul’s letters to the Corinthians and Galatians. Both of these readings remind me that some things never change. Week one, I managed a 3-mile run and yoga, and two brisk walks with the dog. This week has seen me back in the gym early for elliptical work, then body pump and Pilates. My goal weight is 110. I’m at 123, which is up a couple of pounds from last month. February is Girl Scout cookies month. What else can I say? Recipes are in my notebook; projects are in folders. Tax docs go to Mr. Official and college info to Swimmer Girl. We’re going to ignore the microbursts of mail sitting on the island and my sewing table (next to the desk.) Organization is sadly still not a habit but it is getting better. I stumbled over a video imbedded in this entry at How to Live Richly on a Budget. It’s 12 (highly entertaining) minutes so grab a cup of coffee and settle in. The upshot is in the last couple of minutes where he describes a scientific “discovery” for success by doing the following daily activities for 21 days in a row. Science and scripture are in sync; good things come from kindness, self-control, patience, love, etc. So what would you like to change in your life? There’s no reason to wait for next January – I hope you’ll commit to it today. And tell others what you’re trying to do so they – and we – can encourage you!